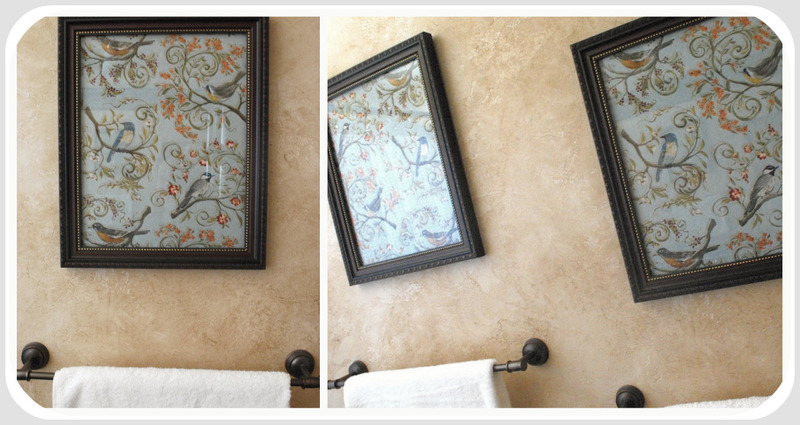 Look at these fabulous prints I just added to our main bathroom! Yes, these lovely pieces of art are actually pieces of fabric. I have to tell you all a little secret...I have a little bit of a fabric infatuation. I have been scouring fabric stores lately...our new home is in dire need of pillows, curtains, etc. etc. And although on this particular trip I had no luck finding any fabric for the things I need, this lovely bird print caught my eye. I immediately thought that it would look good on my bathroom walls...yes I did...and I bought me half a yard. Now, because this is a quilting fabric...it is very lightweight...I personally wouldn't use it for a pillow or for curtains. But it was perfect for framing...and it was on sale. For half a yard I only paid $3.50 or so. I just wrapped the fabric around the backing cardboard and taped it with blue painter's tape to the back (removes easily, leaves no residue). I popped the cardboard back in the frame and had me some pretty prints for less than $7 each including the frames! Check out other Art on the Cheap ideas I blogged about here , here and here. This fabric art looks great. And you are right about the Wal-Mart frames, sometimes you find ones that look better than the rest for the same price. Very nice. What a brilliant idea! Those are beautiful! What a wonderful fabric! Can understand why you would leave that behind. Great idea, Wendy! I've done this, too, but don't know why I didn't think of it recently. I just painted a frame and I want to change out the picture, too. I'll have to check my fabric scraps! That fabric suits you perfectly. What a nice and inexpensive idea! Oh my gosh, I can't tell you how many pieces of framed fabric I have around my house. I too am a fabric-aholic - I just love it! Those prints are beautiful!! It's amazing how easy turning fabric into art is. They look great! I have a bit of a fabric infatuation too...and that's a bit of an understatement. I have 2 fabric stores in mind for you to check out in Utah, but I can't think of the names or addresses (very helpful, I know). I'll look online and see if I can find them. I know one is kind of by the new Market Street on the East side (by the base of the Cottonwood canyons), and the other is in Draper. They had Amy Butler fabric there and other great stuff. Again, I'll see what I can find and email you addresses if I find them. Very cute idea! I love that fabric~ Thanks for sharing! I love this idea! It is visually beautiful and inexpensive! Beautiful fabric and I love what you did with it!! I keep my eye on the frame packs at Costco - they are always a good deal, but they mark them down every few months when they get new designs in. Yay for this fun project! Tweeted! Love it! Nice fabric choice! Wendy, the walls in your new home are gorgeous! What is up with that finish? Are they plaster? Dry wall compound and multiple colors of paint? Did you do them? I just love all the peeks you've given us. Can you share more?? You are a terrific blogger, by the way! Totally an inspiration. Thank you! I am the same way. I have used fabric to make art in frames in my house too. I love your idea. So easy and cheap. I used mine as the back ground for a necklace board and then a hair flower board thing for my neice's room. I don't have a link for the hair bow yet, but if you're interested, here is the link to my necklace board. I love it. noelic.blogspot.com/2009/08/fun-crafting.html I got the idea from a decorating magazine.